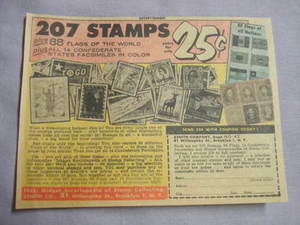 1962 Ad Zenith Stamp Co., Brooklyn, N.Y.
Home > Ads and Magazine Articles > Stamps, Coins, Banks, Rocks, Minerals > 1962 Ad Zenith Stamp Co., Brooklyn, N.Y. This is an original trimmed 6 1/4"x4 3/4" 1962 illustrated color ad from a comic book for "Zenith Stamp Co., Brooklyn, N. Y." 1962 Ad Jaro Stamp Co. & Maxim Stamp Co.
1963 Ad Zenith Stamp Co., Brooklyn, N.Y.